Version 1.0 – 2012/04/03 – original text. In Section 3.1 Camera Controls, in reference to the top buttons and the Quick Control Screen (page 75 and 82 of the PDF) I wrote that you can press the [Q] Button and then press one of these top buttons (ISO, AF, Metering Mode, etc) to quickly change their settings using the respective dial. However, you do not press the [Q] Button for this function but rather the INFO Button. As also explained on page 336-337 of the Canon manual: the INFO Button is pressed first (not the [Q] Button as I wrote), then view the Shooting Functions screen, and then press the top buttons to bring up those functions on the rear LCD screen, which can then be changed with the respective dial. If you press the AF Point Selection Button after pressing the INFO Button and accessing the Shooting Functions screen, a screen with the AF Points and the AF Area Modes will appear so that you can easily view all your available AF Area Selection Modes. You then press the M-Fn Button repeatedly to change the AF Area Selection Mode. Incorporates above Updates plus corrects various minor typos in the text. NOTE: A reader reported a formatting issue with the iPad-iBooks version 1.1A bought from Apple. I was not able to replicate any issue, but please let me know if you have purchased the guide from Apple iBooks/ iTunes and if you have or have not experienced a formatting issue. I attempted to make corrections for a possible formatting issue that was reported to me by a reader, although I was unable to view or replicate any issues with my equipment / software versions. If you have experienced any formatting issues when reading your iTunes / iBooks version purchased from Apple, please contact me. Cover image of EPUB and NOOK versions now displays with fixed ratio (does not “stretch”). Corrects an issue with Figure 67 in the Nook version, where the image was erroneously and mysteriously repeated and overlaid with text. I corrected the header image at the top of the Table of Contents, when displayed in portrait format, to display the proper 5DIII image. Section 4.6 – Should refer to pages 215-216 of the Canon manual for the Live View precautions (not pages 146-147). Turn the Live View/ Movie Shooting Switch to the camera icon for Live View and to the video icon for movies. Press the START/STOP Button to enter Live View or to begin recording a video. As described in the Shooting 4 menu at the beginning of the text, there are three different Live View/ Movie focus modes and they each operate a little differently. Select your desired mode in the Shooting 4 menu under AF Mode. Or rather than going into the menus to switch between the different Live View autofocusing options on the 5D Mark III, you can instead make the change quickly by pressing the top AF-DRIVE Button while in Live View. The autofocus options will appear on the rear LCD Monitor and can be selected there. Note the two pages of precautions when using Live View on page 215-216 of the manual. While you can use this File Name menu item in the Set-up 1 menu to change the naming convention of your JPEG or RAW files, you cannot control folder naming in-camera. However, this is possible if you open a memory card on your computer. Access (or create) the folder named DCIM on your memory card, open that folder, and create one or more folders with your desired folder name(s). The naming must follow the format 100ABCDE, with the first three digits being the folder number from 100 to 999, and the final five characters as any combination of upper- or lower-case letters or the underscore “_”, for example 201DJK_A. Folders cannot share the same beginning numbers, even if the final five characters are different. 1. Press the AF Point Selection Button on the rear-top-right of the camera body. 2. Then while looking in the Viewfinder press the M-Fn (Multi-Function) Button (on the top of the camera near the Shutter Button) repeatedly. You will see the camera cycle through the various options as the AF Points illuminate in various different ways. A second way to change the AF Area Selection Mode is to first press the INFO Button until the Shooting Settings screen is displayed on the rear LCD Monitor, then press the AF Point Selection Button to display the AF Points and the AF Area Modes Quick Control Screen. You can then easily view all your available AF Area Selection Modes, and press the M-Fn Button repeatedly to change to the AF Area Selection Mode of your choice. 1a. Access C.Fn 2 – Custom Controls and select the button of your choice for Switch to registered AF point, likely the Depth of Field Preview Button. You can also press the INFO Button while registering this function to the Depth of Field Preview Button to some of the button options, and choose to switch to the registered AF Point when the button is held or when it is simply pressed, using the settings Switch only when btn is held or Switch each time btn is pressed. You will know if these additional button options are available with your button of choice if the INFO icon appears on the screen. Autofocus (AF) Mode / Drive Mode Selection Button – Press and release this button then turn the appropriate dial to change the Autofocus (AF) Mode Metering Mode (such as One-Shot AF, AI Servo AF) or Drive Mode setting (such as Single Shooting, High Speed or Low Speed Continuous). Erase Button – This is used to delete images as they are being reviewed on the rear LCD Monitor. You can also access the Erase Images menu item to select and erase multiple images. In Chapter 7 – Metering Modes, the Evaluative Metering section with Metering introduction has been moved to properly come before the Partial Metering section. Canon has released a firmware update for the Canon 5D Mark III, which includes uncompressed HDMI output and enables the center AF point to be cross-type at f/8 maximum aperture. Both of these updates will mostly affect those who use their 5DIII in very specialized situations: high end video recording and super-telephoto lenses with extenders. However, there are also a number of other fixes, including increasing focusing speed when using the AF-Assist lamp and various minor errors with some functions or lenses. Uncompressed HDMI output for video means that you can save uncompressed – thus highest quality – video files to an external recorder via the camera’s HDMI port. Cross-Type Center AF up to f/8 maximum aperture means that you can use a super-telephoto lens with an extender which limits the maximum aperture to f/8 (rather than say f/2.8 or f/5.6) yet still have accurate cross-type autofocusing with the center AF point. Because the Uncompressed HDMI output update includes the addition of some new Movie menus, I will be updating the guide as soon as I get a chance. I have incorporated all the above corrections (except for the Firmware update – still to come) as well as corrected an issue with the EPUB version when read on certain e-readers or with certain e-reading apps, which sometimes caused text to display over images. Hopefully this issue is now resolved. All versions of the guide have been updated for Canon 5DIII Firmware 1.2.1. The new firmware added a couple Movie menu items, as well a improved the autofocus performance of the center AF Point when using a telephoto lens with an extender – as explained just above. This e-book update also incorporates all the previous corrections and clarifications, and adds some additional explanations/ clarifications in various sections of the text. Since the official Canon 5DIII manual was also updated for firmware 1.2.1, I have included the original and new page numbers for all references to the Canon manual, throughout the e-book. I have no other way to contact those who bought the guide from Amazon, B&N, Kobo, or Apple, though those sites may enable you to update the book such as through “Manage my Kindle” or through iBooks. Please contact me for an update if necessary. –New Preface added to introduce the changes due to Canon Firmware 1.2.1. This menu item was added with the Firmware 1.2.1 update. It is used when recording a movie to an optional external movie recording device (See Figure 53b). Note that only the video is output via HDMI, not the audio. If set for No mirroring, the movie recording will be displayed on the camera’s rear LCD Monitor. However, if you attach the camera to an optional external recording device via the HDMI output, that device will be used to view the recording and the camera’s Monitor will turn off. You can turn on or off the shooting information and masking by pressing the INFO Button. The shooting information will show you the remaining capacity of the memory card and battery as well as temperature warnings, so you may wish to enable this on the external monitor. If set for Mirroring, the movie will be viewed on both the camera’s Monitor and on the external recording device, however, the shooting information and masking will not be displayed on the external monitor – you will need to view this information on the camera’s LCD Monitor. Note that movie playback and camera menus will not be displayed on the external device. Also, you can not simultaneously output via both the HDMI and A/V OUT outputs, only through the one that was most recently connected. ISO Speed Setting / Flash Exposure Compensation Button – Press and release this button then turn the appropriate dial to change the ISO Speed Setting (such as 100, 400, 12,800) or Flash Exposure Compensation amount. Note that this button is concave and has a small bump on it to allow you to identify it with your fingertip and change the ISO setting on the fly without your eye leaving the viewfinder. Note that if you first press the INFO Button and access the Shooting Settings screen and then press any of the above three buttons, you can view and change their settings on the rear LCD Monitor, also using either the Main Dial or the Quick Control Dial as you would when changing the function while viewing the top LCD Panel. (For example, both Metering Mode and White Balance options will appear on the rear screen when pressing that button after the INFO Button, and the Main Dial will adjust the Metering Mode while the Quick Control Dial will adjust the White Balance.) This will also work with the AF Point Selection Button after pressing the INFO Button and accessing the Shooting Settings screen. That way you can view the AF Points on the rear Monitor as they are seen in the Viewfinder, or change the AF Area Selection mode by repeatedly pressing the M-Fn Button. As you can see in Figure 54a, icons will indicate which control is used to change the setting, such as the Main Dial, Quick Control Dial, or M-Fn Button. ISO: If these are already too many variables for now, you can just leave your camera set on Auto ISO. But you may find, for example when working in Av Shooting Mode, that the camera is choosing an ISO that is causing it to select shutter speeds that are slower than you wish. So it is best to take control of this setting too. Though remember that if you do use Auto ISO, you can set the Auto ISO range and the Min. shutter speed that the camera will automatically select, so that these settings will stay within reasonable limits. Do this in the ISO Speed Settings menu item of the Shooting 2 menu. 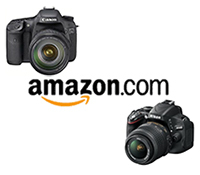 -In Section 14.1 Digital SLR Photography Accessories, some additional accessories were listed, and some of the accessories links have been updated. Version 2.1A and 2.2A – 2013-07-14 – Apple iBooks only. These are the same as Version 2.0, as described above, but due to the iBooks uploading process I had to temporarily make use of these version numbers. HDMI – This Time Code sub-menu option was added with Firmware 1.2.1. Select it to view the options, Time Code and Rec Command (Recording Command). These both only apply to video that you are outputting via the camera’s HDMI port. Enabling the Time Code setting (On) allows you to add the time code to a movie that is output via the HDMI port. Enabling (On) the Rec Command option allows you to synchronize the camera’s movie shooting start and stop with that of an external recorder. In the Preface to the latest Version 2 texts I mention a couple camera menus, such as the Set-Up 4 Menu where you can see which Firmware Version your camera has. Note that the camera needs to be in P, M, Tv, or Av Shooting Mode so that all the menu tabs and menu items are available and visible. You will not be able to see or access the Set-Up 4 Menu and many other menus if you are in Auto (A+) Shooting Mode. I like to put the (official Canon) manual pdf’s for my cameras, etc. on the Documents section of my Kindle Fire for reference. It works nicely to download the pdf to my laptop, save it, and then email to my Kindle documents address. For pdf files too large to email, they can be downloaded on the Kindle Fire Web to Downloads and then transferred (Copy and Paste) from the Downloads folder to the Documents folder on the Fire using the ES File Explorer app. (Need to shutdown the Fire and restart it). I just did that for the (official) Canon 5D III manual to have it along with your ebook for reference. Great idea! Thanks for sharing these instructions. Hi Doug, just wanted to tell you how awesome this book was. (5d markiii). I started reading it and couldn’t put it down. I feel so comfortable using my new camera. This camera is quite different from the 5d markii. It was so great to be able to following along with your book and my camera…reading and then setting up my new camera. I really appreciated that you explained what each screen does!! And what it meant. Because sometimes its hard to understand what some of the new features do and why you would choose them. This book is a must have if you really want to learn all that the canon 5d markiii can do!! Thank you so much for writing this book!! First off, kudos to you for demystifying the 5D mark III. While some may say you can find all of this in the manual, your presentation clearly makes the gobbledy gook understandable! While practice will hopefully move me towards perfection, I still remain a bit baffled with how to use all the af points. I understand the different modes and when to use them, but the number of points to use is unclear. I shoot a lot of pics of a marching band as they pass me on the street. Not infrequently, I take a shot and then the camera will be trying to focus all over the place. I know it’s me and not the camera. Stick to center focus with minimum number of points or…? Thanks for the nice feedback on the book! Being able to select a specific AF point will allow you – of course- to focus exactly where you wish to. Or if you are tracking a subject using AI Servo focus mode, it will allow you to tell the camera which subject to initially focus on and begin to track. The problem with the 5DIII is that it has so many AF points to choose from, some users may find it challenging or too time consuming under the heat of shooting to manually select their desired AF point. In that case, you can either limit the number of available AF points (in the menus or custom functions – I need to look up which one). That way you don’t have so may AF points to choose from, and you can quickly get to your desired point. Or you can use the AF area modes, where you select a group of points and which may more quickly allow you to select the general area where you wish to focus or track a subject. The downside of the Zones is that the camera doesn’t know exactly where you wish to focus, so the focus may not be right where you want it to be. Doug, thank you for creating such an informative and well organized book. It not only demystifies the Canon Manual, but presents actual real-world examples and uses of all the many options. The manual tells you how to adjust the settings, but does not give much insight as to which is good for what. I have the Apple iBooks version and find using the ipad along with the Mk III the perfect way to practice what you are preaching. It is so much more efficient than trying to read the pages of a book while at the same time working with the camera. I just prop the ipad in landscape mode, read the pertinent pages while adjusting the camera and trying out your settings. I believe I have found one small error with the ibook version and that is in Chapter 7 (Metering Modes) where the Partial Metering section comes before the Evaluative Metering Section. I also have a question about the “Cases” when using AI Servo Autofocus. After you have selected the AF Area, is all you need to do is go to the AF1 Menu and use the Quick Control Dial to select the appropriate Case? Do you need to press the Set Button? And is there any indication using the Info button or some other method to tell you which Case you are using while shooting? If you wish to experiment with different Cases during a single shoot, it would be nice to be able to check your photos later to see the pros and cons of each Case. Again, thank you for this fabulous book. It has helped me immensely. And thank you for pointing out the error with the metering modes sections being switched. I am not sure how that happened, but I will correct that as soon as I can, and I will try to remember to send you a revised copy. There are a couple other unpublished revisions I need to make, as shown on the book’s update page. I will look into your questions about the Cases when I get a chance to sit down with the camera and have a look. Off the top of my head, you probably need to press the Set Button to finalize your Case selection (and the manual says to press Set), but I need to look at that. I don’t believe there is any quick way to check which Case you are using while shooting, though that makes a lot of sense to be shown on the top LCD or on the Q Screen – perhaps in the Mk IV! It may be in the metadata of the image when you look at it in Canon DPP software, but I don’t think it is – again, I will look. Also, you can likely put the C.Fn setting for Cases in My Menu, so that you can access it quickly that way if you wish (though since AF1 is an entire Tab of its own, this isn’t really that much quicker). Hi Doug – I’m reviewing the book for the second time. Thanks again for writing a great book on this camera and including the updates. I’m very glad to hear that you are finding it so helpful – feel free to spread the word! Will there be an update e-book or a supplemental published for firmware 1.2.3 ? I have your e-book version 2.0 for firmware 1.2.1 and it’s been great reading – on my second read now as there’s a lot of content to absorb. I’m glad you’re finding it helpful! Because firmware 1.2.1 added some new features and menu items, I updated the guide at that time. However, firmware 1.2.3 mostly fixed some glitches and bugs, and doesn’t really affect any menus or descriptions in the guide, so I haven’t made any updates.